The latest must-binge original offering from Netflix comes in the shape of a six-part documentary series about a small religious movement (or cult, if you prefer) that moved into a small Oregon town in the 1980s. Under the wisdom of their then-silent Indian guru Bhagwan, a large swarm of Rajneeshees (made up seemingly of mostly white westerners, but with all of them dressed in bright red) turned a vacant ranch plot into their own utopia. It was a gobsmacking, full-functioning community that included rows of homes, a massive assembly hall, a pizza parlor, a dam and a private airstrip. But the construction of this self-made paradise proved to be just the beginning, as they clashed with the Oregonians who saw their size and growing influence as a threat, despite arriving in peace: biochemical warfare, assassination attempts, electoral chaos and much more ensued. Easily one of the craziest documentaries I’ve ever seen, Chapman and Maclain Way’s six-part series “Wild Wild Country” boasts a profound narrative with intricate human beings, an amass of intellectual themes and more twists than you can count. Told chronologically and using 250+ hours of footage and extensive new interviews, it places you into the contrasting experiences of people in this bizarre saga, leaving you to wonder in part how such a story could have been so forgotten by American history. And after the six-plus hours of “Wild Wild Country” flies by, you won't want an approach to this story any different or shorter than what the Ways do: The Ways know that they have the constructs of a great drama just as much an extremely potent list of discussion topics, and are able to make their presentation of these events the very definition of fascinating entertainment. “Wild Wild Country” concerns the beginning of life, in the Rajneeshee sense, with an expansive spiritual awakening lead by someone who wants to create what he calls “The New Man.” As we hear from select members of the group, each who had a huge influence on the dramatic events that follow, there’s a nonpareil sense of the harmony, and how it gave Rajneeshees something deeper than family. “We really did feel like we were the chosen people,” one of them says. Throughout, they talk fondly about what Bhagwan’s teaching meant to them, and the purpose it gave them. But in the case of his personal secretary Ma Anand Sheela, who speaks quietly in a dark room as if sharing the most mind-blowing bedtime story ever told, there's a clear of the power the Rajneeshees had as an enterprise, for good and for evil. In just one of its offerings, “Wild Wild Country” essentially offers the full story of a true civilization, its glorious rise and unbelievable downfall. Fear of the outsider is certainly one timeless theme within this tale, as exemplified by the unassuming but charismatic people who live in Antelope, Oregon, which was known for its population of 40 people, most of them retirees. The residents who speak on camera talk about the absolute culture shock of the Rajneeshees coming in next door, and it becomes clear that the fear only sparked more defensiveness that turned into aggression on both sides. The images seen in the docuseries’ beginning moments, of swarms of people in red strolling through their quiet Oregon town as if it were a peaceful invasion, are startling enough. But that evolves into more surprising tension, especially when the American legal system gets involved, and tries to find any bureaucratic way possible to shut down the Rajneeshees. Designated as a “film” in the end credits, "Wild Wild Country" is broken into six parts with excellent cliffhangers leading into the next one, but fear not: it's a binge-ready epic in which the filmmakers are dedicated to all major plot details; the juicier bits might be more exciting than the bureaucratic stuff, but the pacing of the story never drops out. Curiously, the Ways don’t introduce their subjects a second time as so many documentaries do, but that seems like an artistic statement itself: the people are all very memorable, and become symbols of their respective viewpoints. 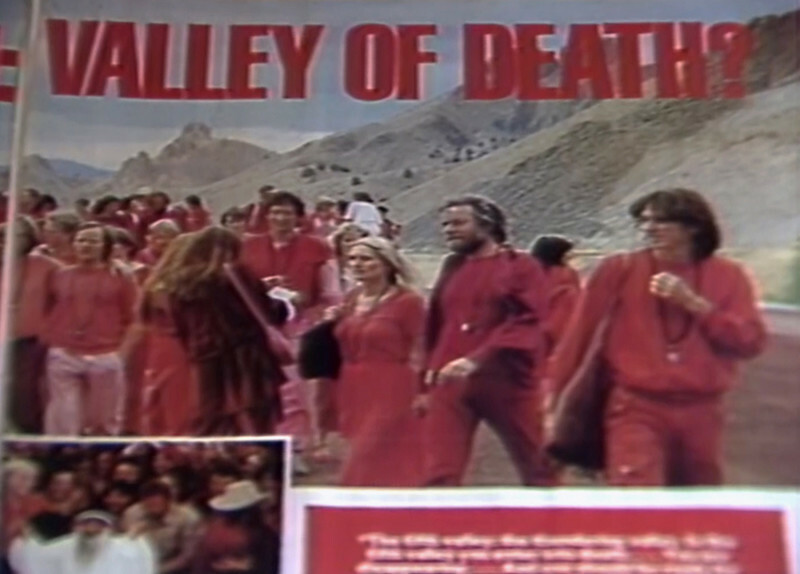 The talking head interviews add more to the story instead of normalizing the production, and like with the contemporary, excellent songs used to proclaim further storytelling inspiration, “Wild Wild Country” proves to be invigorating historical documentary filmmaking. The size of “Wild Wild Country” especially pays off as the film explores so many huge and various issues: old vs. young; believers vs. nonbelievers; conservatism vs. free love; fear vs. compassion; the honest potential for perfection when humans are themselves imperfect. These all become more fascinating given the story’s complications between who is right and who is wrong in this story. The Ways never take a stance or simplify the issues. As one of the Rajneeshees advises about the journey of following Bhagwan, “the truth lies within.” That might be the largest force within “Wild Wild Country,” the way its logic always goes back to the seed of belief, how a feeling deep in one's gut can send a person on the wildest of journeys. Watching this documentary becomes a personal experience itself for the viewer, as the viewer is not only invited to take whichever side in this story, but their feelings towards these subjects are guaranteed to change from part to part. Hearing about this story in a way that's equally vivid and surreal, you are faced with an endless amount of questions about what this all means, and what you would do if you were an Oregonian confronted with so many outsiders, or a Rajneeshee willing to die for what you believe in. By handling this story so intelligently and by opening its heart to a very complicated idea of good and evil, "Wild Wild Country" has a profound, mesmerizing power itself.